What is a Giant Panda Like? 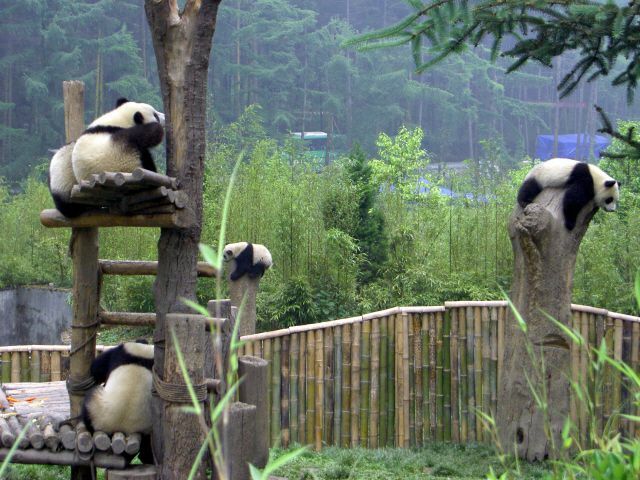 Have a look at the Giant Panda's historic habitat and you can easily get depressed. The panda's habitat used to cover most of southern and eastern China as well as small bits of Myanmar and Vietnam. These days, Giant Pandas only live in tiny pockets, mostly in the mountains of Sichuan Province. Pandas are extremely reclusive, and seeing one in the wild is very rare. The look like big cuddly bears but in reality, they are very shy and like to be left alone. The best place to see them in action is in the Giant Panda Research and Breeding Center in Chengdu. Pandas are loners. Although they appear to have been carnivorous at some point in their evolution, they adapted to eating only plants – and only bamboo – but retain a solitary nature unlike other herbivores. They keep a small territory and don’t wander too far. They also don’t have rigid schedules, eating, sleeping and playing whenever and wherever the mood strikes them. The Giant Panda Breeding and Research Base points out, however, that over 50% of a panda’s day is spent eating, over 40% is spent sleeping, so whatever is left over is devoted to play. In the spring, for a mere three months, older pandas of at least 7 years, search each other out for the mating season. After mating, pandas retreat to their own territory. Pandas love water and make their homes near a water source. Pandas sometimes over-drink and act drunk making it even more beloved by the Chinese people as legends surround why the panda does this. Pandas are playful and not the least bit aggressive. Mountain dwellers have reported them mischievously getting into their homes and playing with kitchen pots and pans and then discarding them in the woods later on. They’ve also been known to befriend domestic animals such as a sheep or pig and sleep and eat together with them. Chinese people nickname the Panda “Miss Panda” since they often exhibit shy, even coy, behavior such as covering its face with a paw or ducking its head when confronted by a stranger. Notably, mother pandas protect their young as you’d expect so just like any other bear. Don’t come between a mama panda and her baby if you happen upon one in the wild. If you want to see and experience Giant Pandas who seem to be extremely well taken care of, then you should definitely put a visit to Chengdu in your itinerary. The Giant Panda Base is the best place for 100%-guaranteed-viewing. Read more about The Giant Panda Research and Breeding Center to schedule your visit there.